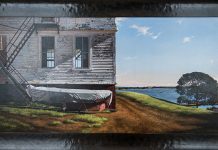 In one of her biggest shows yet, Louisa Gould is celebrating her gallery’s 15th anniversary with an exhibit of 15 artists called “15 @ 15.” Some of them will be on hand for Vineyard Haven’s First Friday Art Walk on August 3. 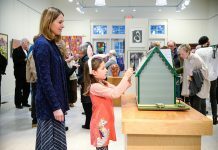 Turning 90 this year, Edgartowner Nancy Furino says of her paintings, “I love good, simple design, whether a building, a city, or a panorama. 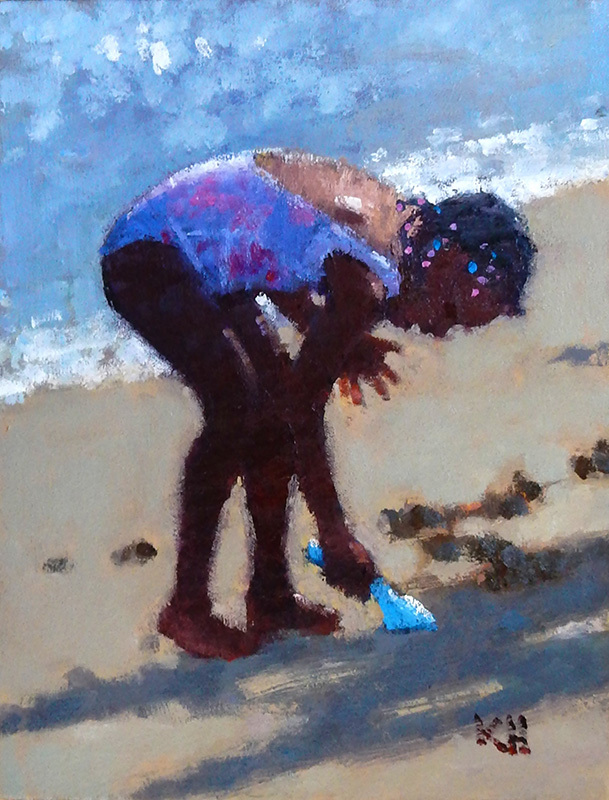 I exaggerate on purpose to convey the feeling of a subject.” Although she has exhibited at Louisa Gould for many years, the 10 paintings on display are new to the gallery. “The Big Plane” captures the Katama airport with a bright red Piper Cub-style light airplane angling up in the foreground to the center of the composition — all on a clear summer day. 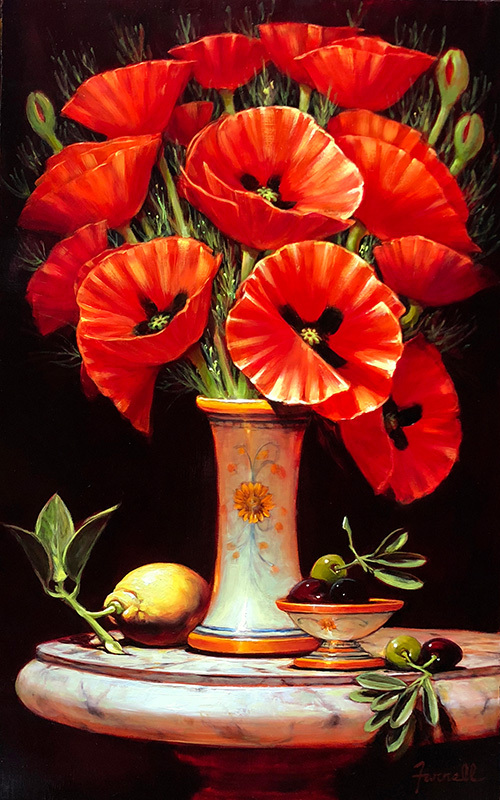 Anyone who loves flowers should spend time with Vineyard Haven artist Peggy Turner Zablotny’s work. 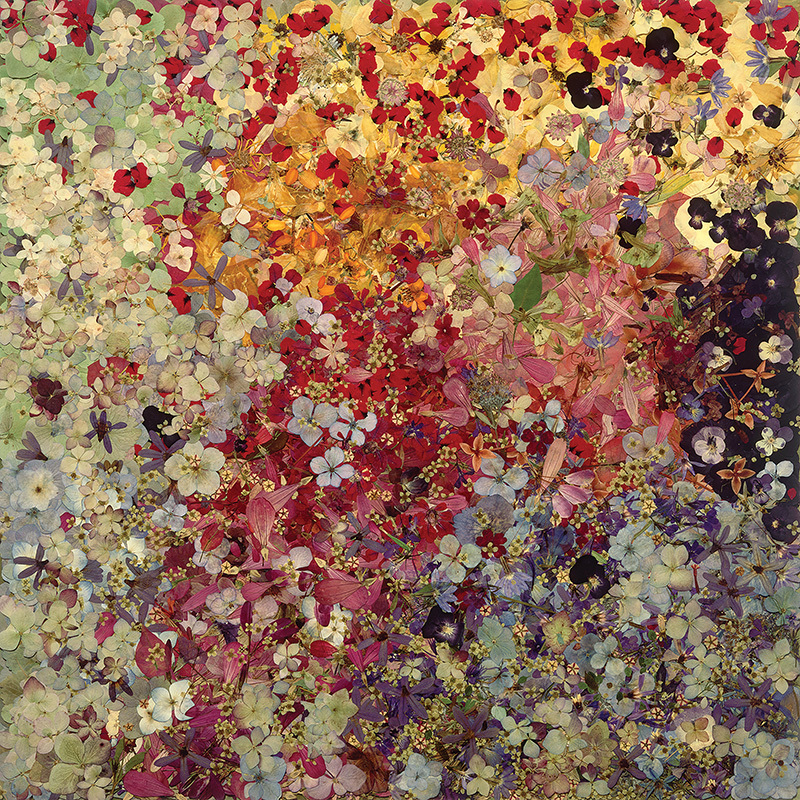 She grows, harvests, composes, presses, and photographs floral compositions that combine the best aspects of abstraction with the flowers she uses. “My garden is my palette,” she says. She hopes to inspire people to look beyond their first impressions of flowers. In “Very Verbena,” she matches the flower’s intensely red blossoms with white ones, adding two purples to create what could be a handsome bouquet. 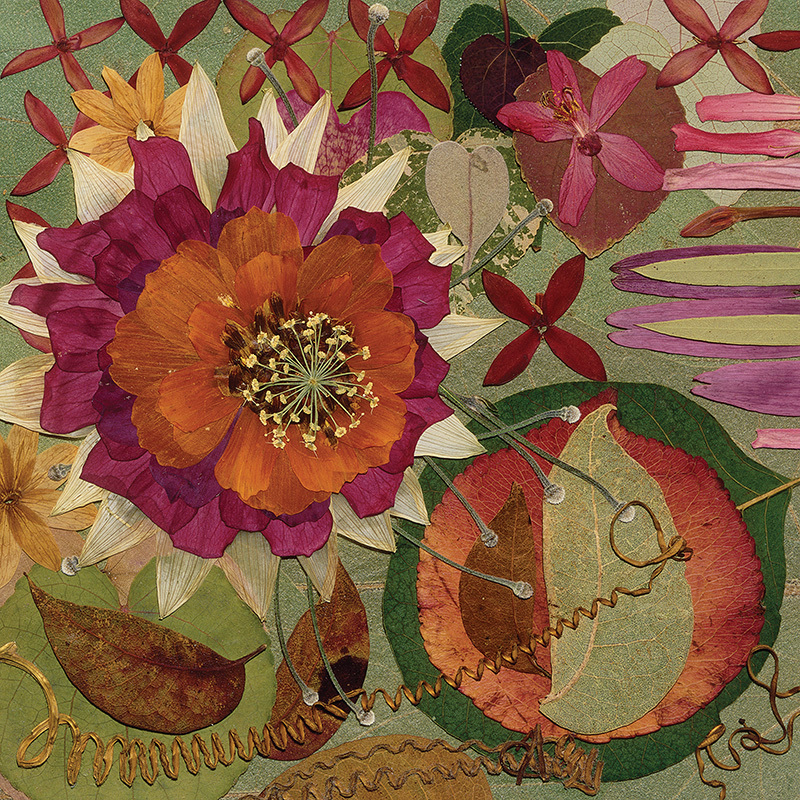 “Her palette is more subdued this year, and her longer rectangular format is new,” Gould says. Cape Cod artist Rick Fleury says of his own work, “Ever inspired by the coast, I am always looking for new and interesting ways to capture its beauty, and push to find new ways in terms of palette and brushstroke, content and emotion.” In “South Beach,” the artist uses a purity of muted colors and composition that evokes the sense of expanse in water, shore, and sky. 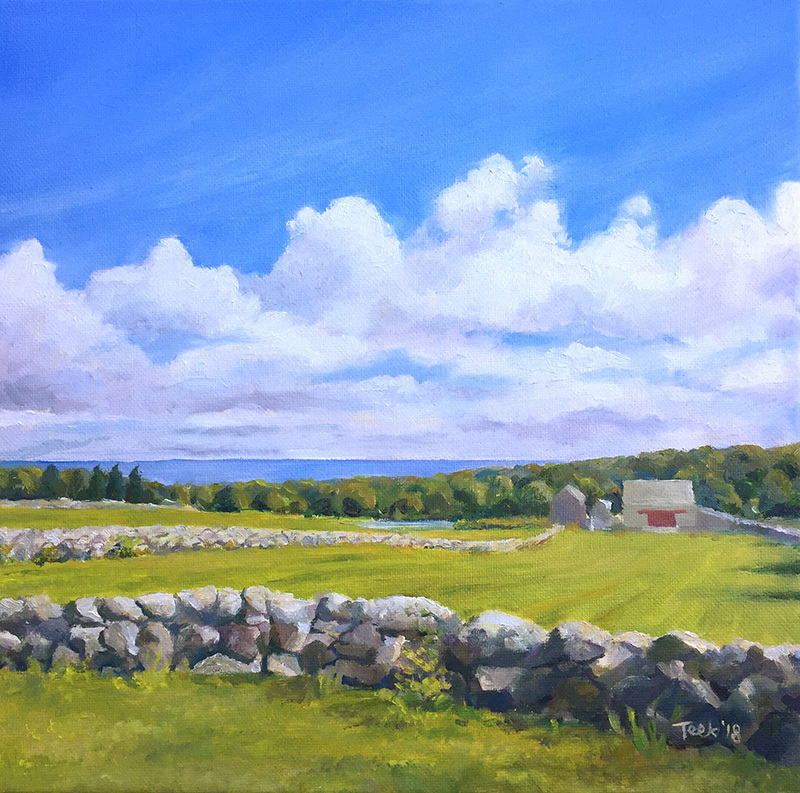 Providence oil painter Kate Huntington is well known for her portraits, and people often inhabit her landscapes. An example is “Mother and Child Walking on the Beach.” This charming work places the walkers midway between the sandy beach, surf, water, and red-flecked sky. “I come to the Vineyard for photos,” she says. She takes them home and paints from them. 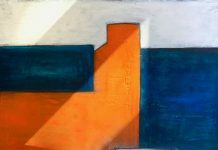 Abstraction is the name of the game for another Providence painter, Theresa Girard. 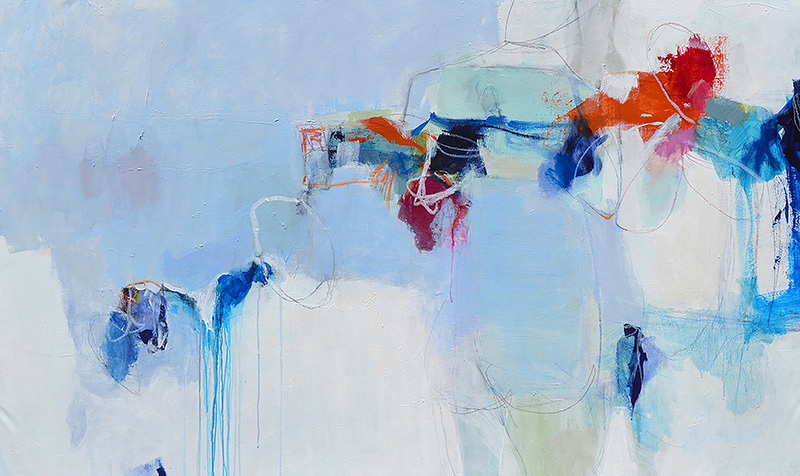 She uses color to convey complexities of composition that offer a sense of balance. In a large work, “Penance,” a line of color clusters moves up from right to left before a blue background, in slow-moving flight. Also from Providence, Nick Paciorek, an urban-oriented painter with highly saturated colors, is painting Vineyard scenes for the first time. They include the Gay Head Cliffs, the Black Dog wharf, and a number of Island cafés. 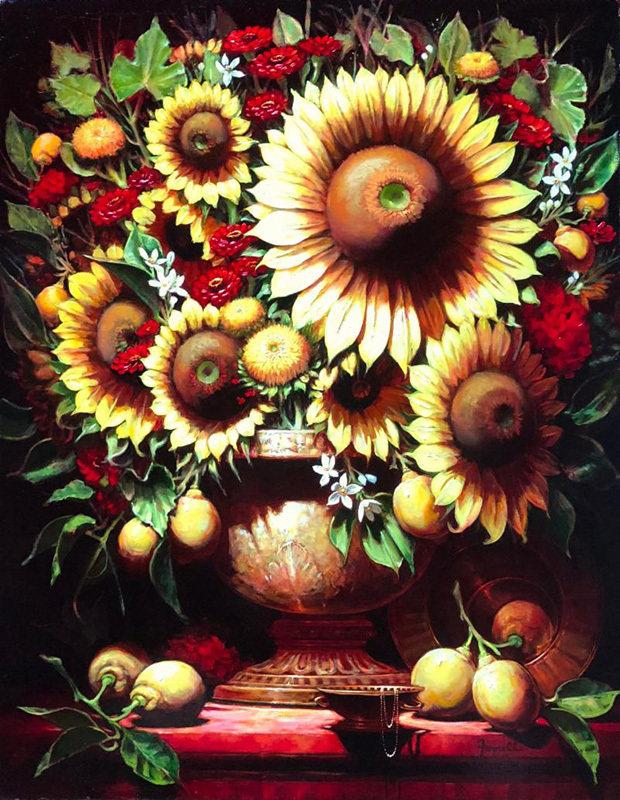 Richly colored still lifes are a hallmark of Connecticut artist Sean Farrell’s paintings. He has traveled all over Europe, and, in particular, Italy, in search of inspiration. 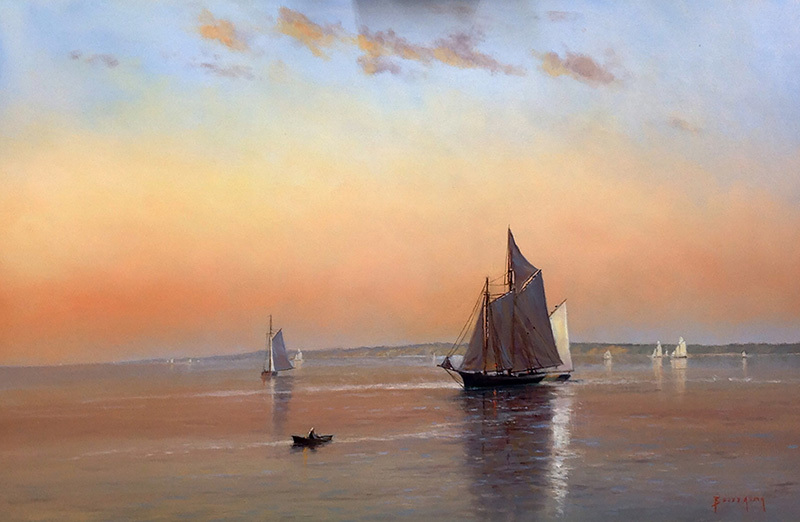 Seascapes and ships are a favorite subject for Paul Beebe. 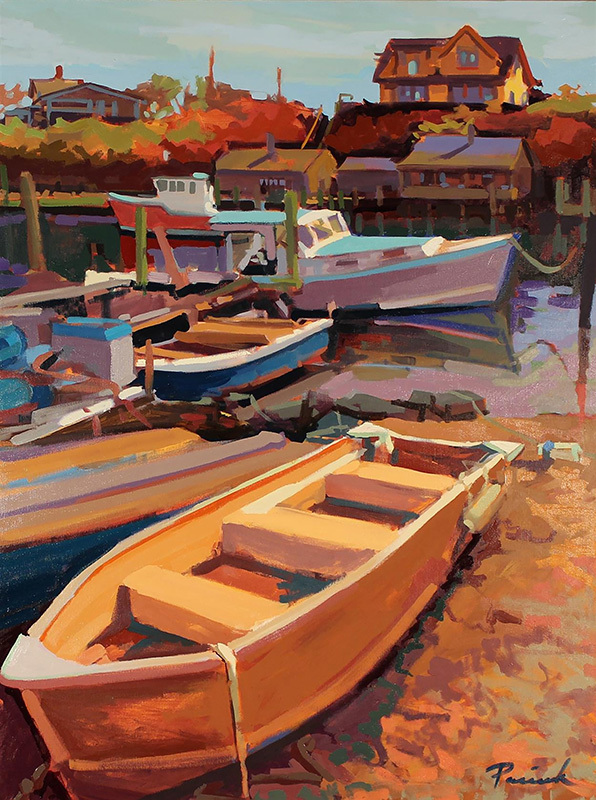 The Connecticut artist has found Vineyard marine subjects a particular favorite. Two potters have work in the “15 @ 15” show. Vineyard Haven artist Jennifer McCurdy uses transparent porcelain bodies because of their beautiful surface. One example is “Coral Nest,” on display with other white sculptures. Curtis Hoard, a retired professor of art at University of Minnesota/Minneapolis now living in Tucson, Ariz., has taken the concept of a vase and transformed it into unusual sculptures. Sculptures are also the medium for West Tisbury seasonal resident James Murray, who puts together works drawn from castoffs of both human activity and nature. Birds and marine animals are the subject for sculptor Brian Arthur of Hilton Head, S.C., as well as the Living Series of bronze collectibles. 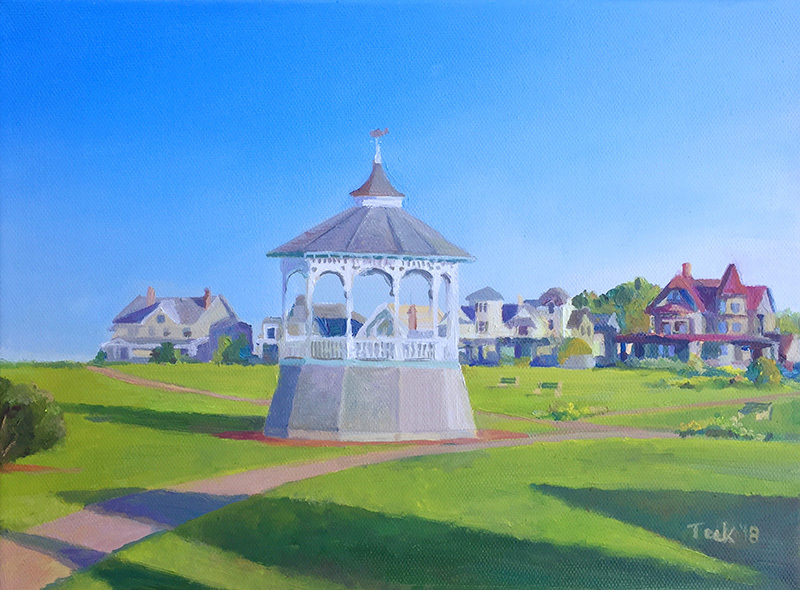 Known for her architectural renderings, Vineyard Haven seasonal resident Teek Eaton-Koch has a series of Vineyard landscapes on display, including the Gay Head Cliffs, Lucy Vincent Beach, and the West Chop Lighthouse. 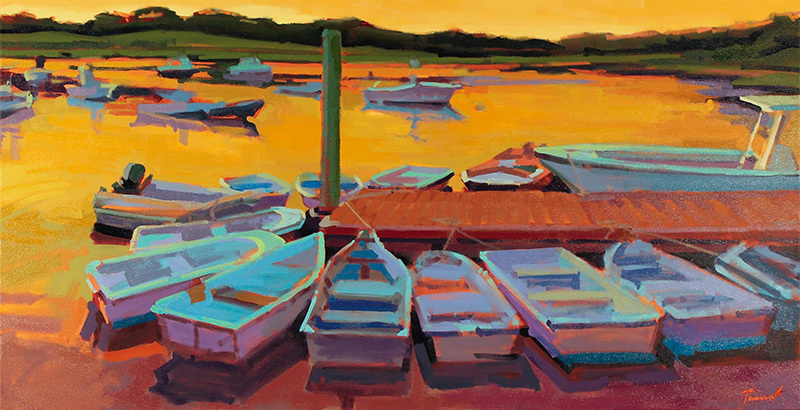 Light plays an important role in the landscapes by New York painter Christie Scheele. Last but not least, photographer Louisa Gould studied art on Martha’s Vineyard as a child. As well as running her gallery, she has made a career as a sport and travel photographer. “15 @ 15” runs through August 29. Louisa Gould Gallery, 54 Main St., Vineyard Haven. 508-693-7373; louisagould.com.